When your upper eyelids begin to droop and sag, it not only creates a displeasing, tired look, it can interfere with your vision. If you have experienced these problems, it’s time to consider eyelid rejuvenation surgery (blepharoplasty). Eyelid surgery and repair can be done alone, but many of our patients in the Fort Myers area combine blepharoplasty with other facial surgeries such as a brow lift or a facelift. In doing so, Dr. Mandraccia can also smooth the wrinkles around your eyes and lift sagging eyebrows. Some medical conditions make eyelid surgery more risky, so remember to share your complete medical history with Dr. Mandraccia during your initial consultation. To set up your consultation with our Ft. Myers plastic surgeon, call (239) 443-4633 today. Eyelid surgery is a fairly quick and painless outpatient procedure taking about 45 minutes. Dr. Mandraccia will first use a local anesthetic to numb the area. Then he will create a small incision in the crease of your eyelid so he can remove excess fat and tissue. After the tissue and excess skin is removed, Dr. Mandraccia carefully closes the incision. The blepharoplasty procedure leaves virtually no scarring and will give your eyes a dramatically fresh appearance. Dr. Mandraccia normally discharges patients within an hour of the operation, and most report little postoperative pain. No bandages are necessary, but you will need to come in for a follow-up appointment within five or six days, so Dr. Mandraccia can ensure the healing process is going smoothly and so he can remove your stitches. Your eyes will be swollen and discolored for about 10 to 14 days, after which you should be able to resume all normal activities. Dr. Mandraccia performs most plastic surgery procedures while the patient is under IV sedation and with a certified nurse anesthesia present. His office has been certified by the Florida Board of Health as meeting its stringent requirements. Patients can opt for general anesthesia in the surgery center located in our building, which is jointly owned by Lee Memorial and Naples Community Hospitals. If you are considering eyelid surgery in the Ft. Myers area and would like to schedule your confidential consultation, please contact Dr. Robert V. Mandraccia, MD at (239) 443-4633 to schedule an initial consultation. 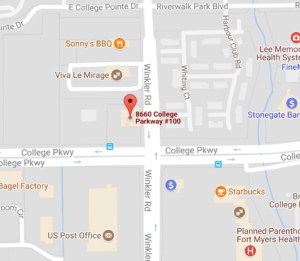 Our Fort Myers plastic surgery office is conveniently located on Route 41 at Seven Lakes Boulevard.